Check a child's ability with a reading level assessment. 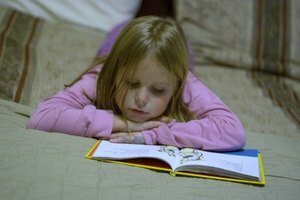 Children learn to read best when presented with books at their reading level. If a text is too easy, it presents no challenge to the young reader. If the text is too difficult, the child will likely become frustrated. To ensure that the child is presented with a book perfect for him, anyone instructing a child in the fine art of reading should begin this instruction by performing a simple assessment of the child's reading abilities. With a few leveled texts, and an ear for errors, anyone can check a child's reading level and, thereby, increase the effectiveness of the child's reading practice. Listen to the child read a book at his academic level. If the child is a first-grader, start with a first-grade leveled book. Find a book at that level either by checking the reading level printed on the back of the book or by referencing a list of leveled books (see the resources section). Most books for young children have the reading level printed on them near the bar code. Look right above the bar code for a notation that reads "RL:". This notation will be followed by a number with a decimal. The number to the left of the decimal is the grade level, and the number to the right the month. For example, a book that reads RL:1.5 is intended for a first-grader in the fifth month of school. Count the number of mistakes that the child makes while reading. Count any mispronunciations, skipped words or misread sentences as a mistake. Use a scrap of paper and make a tally mark every time the child makes a mistake to make it easier for you to keep track. Count the number of words in the book to determine the child's fluency. A child who can read fluently should make no more than five mistakes for every 100 words in a text or have an error rate of no more than 5 percent. To determine the child's error rate, take the number of errors that you noted and divide it by the number of words in the book. Ask the child to read a lower reading level book aloud if his error rate is greater than five percent. Repeat the process of making tally marks for each error, using a book that is one level down from the one you initially presented. Use your tally marks and count the words to determine the error rate for the lower level text. Give the child continually easier texts until he is able to read it fluently. Move down one level at a time, repeating the procedure again and again until the child's error rate lies between 1 and 5 percent. Present the child with a higher reading level book if he makes no mistakes as he reads. If the initial reading is perfect, it is quite possible that the reader is advanced. To determine exactly where his skills lie, repeat the procedure, giving him higher reading level books. Continue to provide harder texts until the child reads a text orally with somewhere between a 1 and 5 percent error rate. Some errors are expected when a text is appropriately challenging. Once you have found a text level at which your child makes some reading errors but has no more than a 5 percent error rate, you have located the appropriate difficulty level. 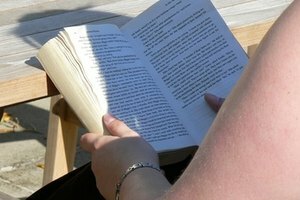 What Is Oral Reading Fluency? Schreiner, Erin. "How to Test the Reading Level of Children." Synonym, https://classroom.synonym.com/test-reading-level-children-6394986.html. Accessed 21 April 2019.